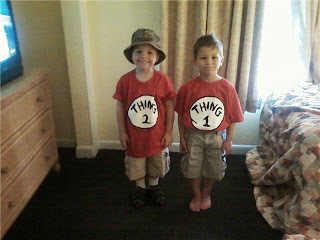 Right before we left to go to Disney. 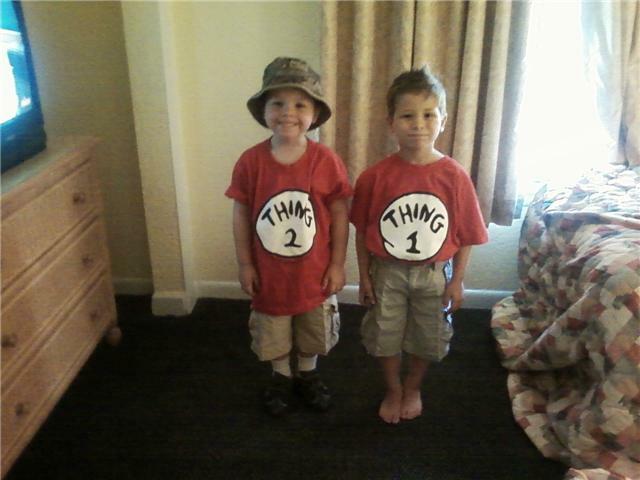 This is how excited they were to get into Disney. This is right after we pulled in the gate. On the tram to get to the park. The women's restroom had a vending machine for personal products. I've never actually seen a vending machine in a restroom before. We spent our first two hours inside City Hall with these fine citizens. Because it started storming the minute we walked through the gates. It cleared up around five and we were finally able to get around. I didn't take many pictures because we were running around pretty quick to get where we wanted to go. We liked the Mad Tea Party ride though. This pumpkin was at Mickey's house. Only Dillian would take his picture with Mickie and Minnie. The four of us at Minnie's house. The boys with their glasses on that they were supposed to use at the electric parade...but instead they wore them in the condo. It was a fun, but quick visit.